Hey you know what you should make this week? And by should, I mean need to? These. You should/need to make these. Let me just put it this way: They taste like the holidays in cookie form (although, hold up — are meringues considered cookies? Or are they more like a candy? Or are they just in their own hybrid category? I like to think of them as cookies so let’s go with that), but that’s not even the best part. The best part, THE BEST PART, is that they are filled with chocolate frosting. But I’m getting ahead of myself. Let me explain in a little greater detail why, exactly, you really should (need to) make these meringues. 1) They taste like the holidays in cookie form. Oh wait, I already said that. 2) There is a giant dollop of Hershey’s Special Dark chocolate frosting in the center. OH WAIT, I said that too (just trying to keep you on your feet here). 3) They are super cute looking, which is obviously not the most important thing when it comes to cookies but it is a nice bonus, especially if you make these for a cookie exchange or something. People will be so impressed with your skillz. 4) They’re easy to make! I really mean it. Do not fear the meringue because it has a funny name or because it’s a cookie that’s not really a cookie. It’s also like a pillowy cloud of sugar — and when you bite into these, specifically, that pillowy cloud tastes like dark chocolate and peppermint and cuddles. 5) Just kidding about the cuddles. But these do add merriment to your life, which is a cousin of cuddles. I’ll stop talking now. Basically all you should have gotten from my rambling is that these meringues? They should be in your life. Or need to be. Heat oven to 175°F. Spray two baking sheets with cooking spray; line with parchment paper and set aside. 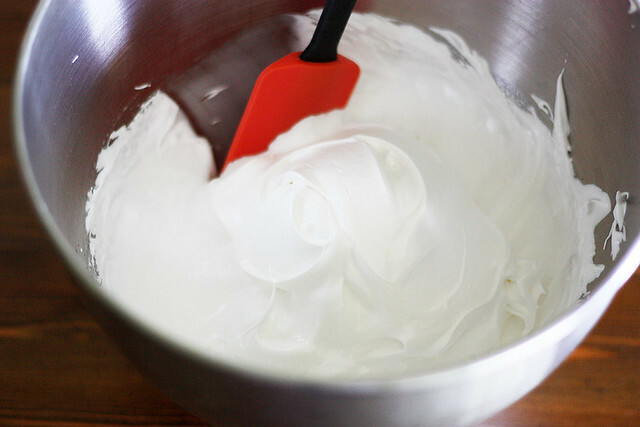 Combine egg whites and sugar in the bowl of a stand mixer. Place bowl over a pan of simmering water. Stir until sugar dissolves and mixture is warm to the touch, about 3 to 5 minutes. Transfer bowl to stand mixer; add cream of tartar and salt. Beat with whisk attachment until stiff peaks form, about 10 to 15 minutes. Add peppermint extract; briefly beat to incorporate. Use a small paintbrush to paint three lines of red gel food coloring up the inside of a pastry bag. Fill bag with meringue mixture. Pipe 2-inch circles about two inches apart on baking sheets (12 circles per baking sheet). Pipe up the sides of the circles to make a cup about 1-inch high. Bake meringues until they are set and can be pulled easily from the parchment, about 1 1/2 hours. Transfer to a cooling rack to cool completely. Pipe frosting into center of meringue cups; top with crushed peppermint candies. Disclosure: I received compensation from Betty Crocker for recipe development purposes. All opinions are my own. These are the cutest thing ever! I am in love with them and I do not even like peppermint! But seriously, I have to make them for Christmas. SO CUTE! So cute! I love the swirl of red, it just is adorable! I could eat them all! If I had these in my house, I’d hug the entire tray of them. No joke…just really grab hold and snuggle. These are adorable! I still haven’t tried the Hershey’s chocolate frosting and something tells me I need to have a date with it…with a spoon…and my face. YUM! These are the number one Christmassiest thing I have seen so far this year. They’re GORGEOUS! And sound delicious. Shut the front door.. these are gorgeous lady!! I don’t care what category they fall in, I want them! These are gorgeous. Oh for cute’s sake…these are beautiful! Oh lady…!!! These are so stunning! These look absolutely stunning- I could gobble up 10 of these at a time! These are seriously the cutest things ever!! Thank you for busting out the holiday treats!!! 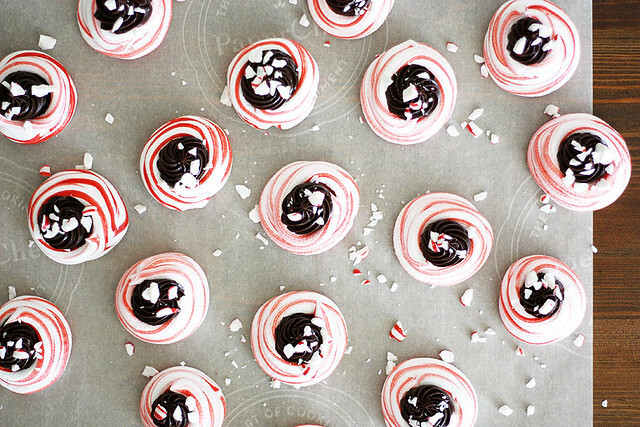 These are beyond adorable, and who can resist peppermint + chocolate! These meringues are so festive! Perfect for the holidays! 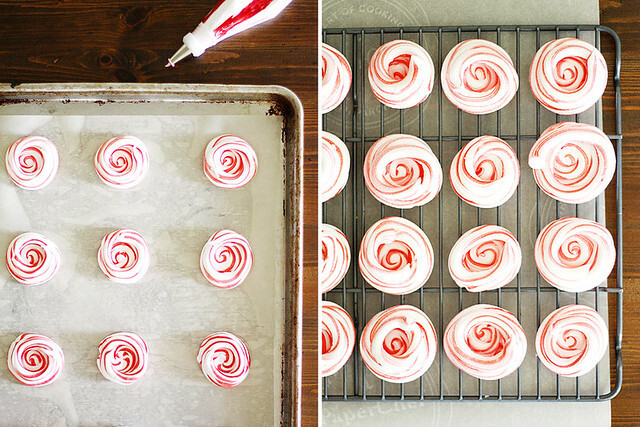 Peppermint + chocolate is my favorite flavor combo ever, and these are just so darn cute! I will have to make them for the holidays! These are so cute!! They are like Christmas rolled into cookie form! I am seriously in love with every single picture in this post, so pretty and festive!! Love those swirls!! These look amazing! Can I just tell you how crazy talented you are?!!!! Seriously, so much amazingness in these meringues! Love, love, love these!! So festive and I bet off the charts yummy! 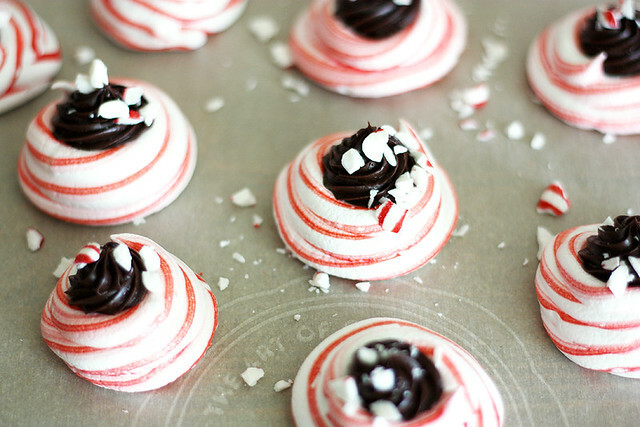 I love how festive these meringues are, they look so adorable and perfect for the holidays 🙂 Pinning! Looks delicious! I’d never thought to made a peppermint meringue! These are the cutest darn things I’ve seen, Steph! What a great idea for the holidays, and super easy too. Great recipe and beautiful photos! Hope you’re doing well! Oh, these are absolutely stunning! Man. I just tossed a bunch of egg whites because I didn’t use them in time after making pasta. Wish I had seen these before. I would have made them that same day! These meringues are gorgeous! Wow, Stephanie! These meringues are gorgeous! And I’m sure that they taste amazing because you can never go wrong with peppermint and chocolate. These are so gorgeous and festive, I adore that swirl! Mmmm. I love peppermint cookies! And meringues? Perfect! 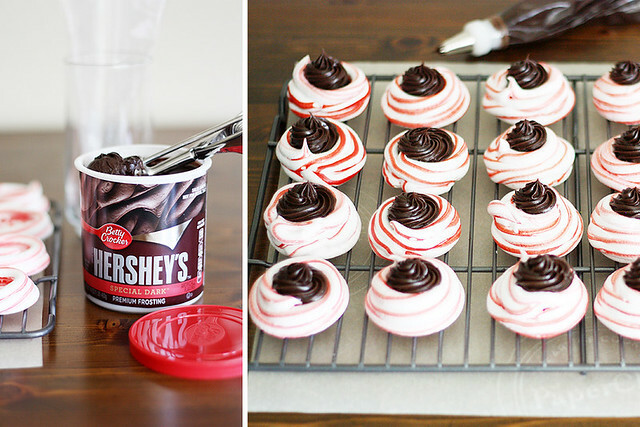 I may try these with chocolate ganache in the center…..
Ok, so I’ve been wanting to try the cutesy striped meringue with the food coloring in the bag trick, but I wasn’t sure if it would really work or if it would poop out after a while or WHAT. But this proves that it TOTALLY works. And I’m totally trying it. These are crazy adorable and would brighten up just about any holiday table! Or my cookie jar. Which is arguably more important. These are adorable and yes, I need to make them. Pinning! So beautiful! I just made meringue frosting the other day and you know what? You are so right, it isn’t hard. I love how festive these are! This is like my favorite flavor combination and the fact that you made something so adorable out of it makes me want to go whip these up right now! I love that red swirl! Genius! Cutest meringues ever!! Love dark chocolate dollops! Yum! It does not get any cuter!! 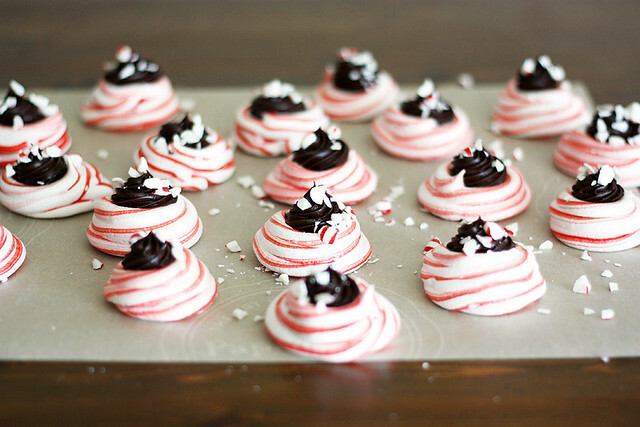 Dark chocolate is my faaaaavorite, and I can’t resist peppermint at Christmastime….mmm!! I am going to make these! Question: do you really spray the baking sheet first and then put parchment on top? If so, why? Sally — You spray the sheet first so the parchment paper sticks well to the sheet and doesn’t curl up! How should I store these? How long before Christmas can I make them? I usually make about 100 dozen Christmas cookies, mostly kinds that freeze well. Can meringues be frozen? Mary — Yes, you can freeze the meringue shells between sheets of wax paper in an airtight container now up until Christmas. But don’t fill them until the day you plan to serve them. Hope that helps! These were really fun to make and turned out great! Painting the bag was much easier than I expected. The meringues needed almost 2 hours of baking in order for them to release from the parchment. Texture was good – still chewy near the center. The outside was a bit sticky, should I try something different next time? Thanks!! Deborah, these cookies can last up to 1 week at room temperature in an airtight container.